Motor city is the U.S.A.
Can the Big Three make vehicles that Americans want to buy? NEW YORK (CNNMoney.com) -- A majority of Americans oppose a bailout of the troubled U.S. auto industry, according to a poll released Wednesday. The CNN/Opinion Research Corp. poll, conducted by telephone on Dec. 1-2 with nearly 1,100 people, showed that 61% of those surveyed oppose government assistance for the major U.S. automakers. The poll comes at a critical time for the American auto industry. Ford Motor (F, Fortune 500), General Motors (GM, Fortune 500) and Chrysler LLC are requesting up to $34 billion in emergency loans from the government amid the weakest auto sales in 25 years and persistently tight credit. 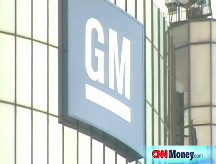 General Motors and Chrysler, burning through billions of dollars in cash, are the most imperiled. All three companies submitted plans to Congress on Tuesday that made their case for funding, and industry executives are set to testify Thursday and Friday as lawmakers debate whether to take emergency action. But Wednesday's poll suggests that Americans believe bailing out the Big Three is a bad idea. A full 70% of respondents indicated that a bailout is unfair to taxpayers. In addition to being unfair, the poll showed that a majority of those surveyed think a bailout would not help the economy. Sandeep Dahiya, a professor of finance at Georgetown University, said the poll results were "quite surprising." The large percentage of those opposed to the bailout "tells you much about how what is good for GM is not good for America." But the disapproval reflected in the poll may not result in the kind of public backlash that occurred in response to the $700 billion bailout package Congress passed in October, Dahiya said. "The numbers are a lot smaller and there's more apathy," in the public following a string of other bailouts in recent months, Dahiya said. Still, public resentment is "festering" and an auto industry bailout is "not going to be an easy sell," he added. Despite being opposed to federal support of the industry, the possibility of a bankruptcy among one or more of the Big Three automakers is a concern for a significant number of poll respondents. While only 15% of those polled think a bankruptcy in the auto industry would have an immediate impact on their families, 43% think a bankruptcy would eventually have an effect on them. Dahiya pointed out that a bankruptcy does not necessarily mean an automaker will stop making cars. "Ideally, a bankruptcy leads to a fresh start," he said. The margin of error for the poll is plus or minus 3%.